Another first class work !! I share this love Lior. Beautiful eyes he has this horse! 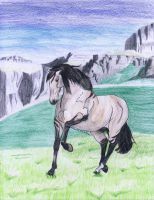 This is a very beautifully drawn horse..
Nice words, that I really appreciate. Omg this drawing is so wonderful and amazing! I love it! Thanks a lot, you are very nice my friend.